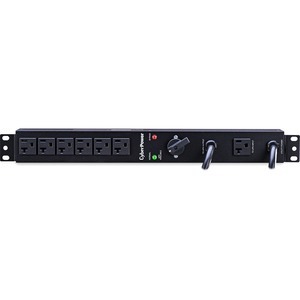 The CyberPower Maintenance Bypass PDU model MBP20A6 is designed to allow seamless transfer of an electrical load from UPS power to utility power for connected equipment. This allows connected equipment to operate seamlessly when performing maintenance, replacing batteries, or installing a new UPS. Set the unit to bypass, perform the updates and return it to normal when done. A 6ft AC cord is connected to utility power; a 3ft AC cord is connected to the output power of the UPS; the UPS draws input power from the MBP via a NEMA 5-20R. When the switch on the front of the MBP20A6 is turned, the power the MBP supplies to connected devices moves from one power source to another with the LED indicating which source is currently active. With a 1U form factor and included mounting hardware, it can fit in a server rack or be mounted to a UPS for a tower configuration. A 3-year warranty ensures that this manual bypass switch is free of defects in design, assembly, material or workmanship.